The Colorful Monarch Butterflies Are Back At Fort Hill On Cape Cod! It was such a treat to see the beautiful Monarch butterflies flitting from flower to flower at Fort Hill. I had been waiting for them to come back from their long migration from Mexico. The Monarch butterfly has often been called the most beautiful and majestic of butterflies and you can tell just by looking at its coloring and patterns. It feeds on Milkweed which Fort Hill has a lot to offer. 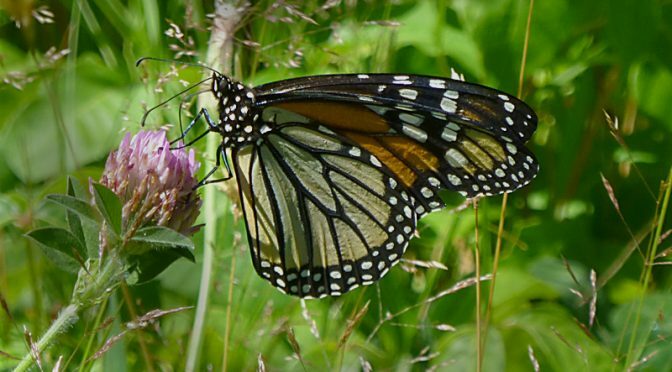 Have you seen a Monarch butterfly this year yet? Gorgeous, don’t you think? It truly is a treat to see these beautiful monarch butterflies! They are spectacular as your gorgeous picture shows!